"Rosarito's Best Hotel Value. The whole family can stay together in a beach front condominium hotel suite." 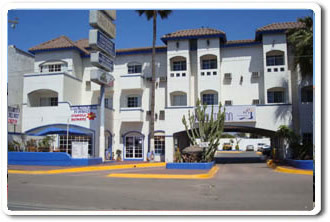 Rosarito Inn is right on the beach in the heart of Rosarito. With uniquely furnished condominium hotel suites of 1,2, 3, & 4 bedrooms, the whole group or family can stay together and enjoy Rosarito in comfort. The list of amenities includes high speed internet, gated entrances, secure parking, 24 hour security, swimming pools, adult jacuzzi, state of the art fitness center, business center, fully furnished, washer/dryer, cable and/or satellite televisions in each room with a combo DVD player, bilingual staff, restaurants and shopping centers, one block from local night clubs, beach access, and so much more. * Over 140 uniquely furnished suites. Click here for more information and to make a reservation. "Hotel, Restaurant and Spa. Can't miss Sunday Brunch"
Hotel La Fonda offers 47 charming rooms and suites, each unique, most with fireplaces. See the sea, hear the surf, watch the sunsets and kick back and relax from you own private patio or balcony. Time stops here. Let worries and cares wash out with the tide, and peace and calm enfold you in our ageless setting. Due to the limited supply and great demand, reservations are highly recommended. *Sorry, no pets allowed at Hotel La Fonda. "Relax in the Lap of Luxury!" If you're planning a romantic getaway, spa retreat, the perfect wedding or simply want to treat yourself or that special someone with a relaxing oceanfront experience, then you have found the right place. From eclectic Spa treatments to the wedding of your dreams at Las Rocas Resort, the pressures of the outside world will simply float away. Give yourself and your significant other the opportunity to be pampered. Las Rocas features a breathtaking oceanfront setting, a diversity of accommodations with 180 degree ocean views, and award winning restaurant offering Puerto Nuevo Style Lobster and the finest hospitality Baja. * Packages and Specials Available. "Enjoy Rosarito in a Carnival Atmosphere!" 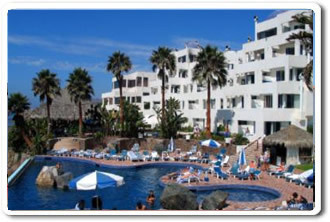 Hotel Festival Plaza Resort opened its doors in 1994 located at the heart of Playas de Rosarito (Rosarito Beach). 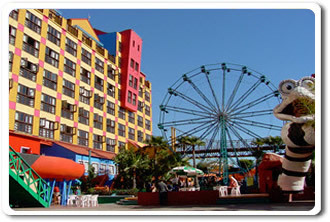 This Rosarito Beach Hotel offers a unique experience under a never-ending festive concept of joy, where youth and those young at heart, will enjoy every minute of their stay in one of the most important lodging and amusement facilities of Northern Mexico. This Rosarito Hotel in Baja California offers within a carnival atmosphere, devoted attention and most of all, high quality in the different services offered to their guests. Splendid fully-furnished and perfectly equipped rooms, specialty restaurants with the best of international food, as well as bars with relaxing atmosphere and open friendliness, make this resort the ideal place to enjoy Baja California. Its excellence enabled it to be chosen to host and successfully serve events of the magnitude of Luciano Pavarotti’s concert, which was held in the Mexicali desert for more than 1200 people under the highest quality standards. All of which was under the strict supervision of their catering department. 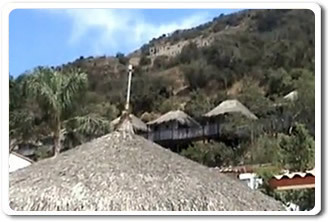 "An Oasis on the Hills - Tropical Cabanas"
A tropical oasis on the hills just 5 kilometers east of Rosarito Beach, and stands out for its amenities and award winning hospitality. 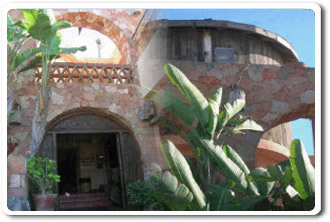 Rincon Tropical features a mini zoo with llamas, eagles, monkeys, koi pond and more. This mountain paradise also offers go-carts for children & adults, two swimming pools, a very well stocked bar and a restaurant with AWARD winning meals with reasonable prices. For those who would like to spend the night in this secluded and very secure hotel, we have rustic cabanas perched up on the hillside that are simply adorable and lavishing rooms spread out on the estate. 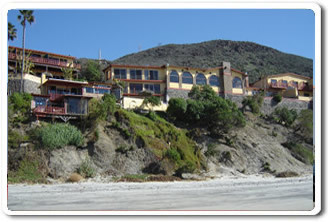 Rincon Tropical offers group end event fee specials year round. Inquire about our Hawaiian style luau special for party events. * Features 16 Exclusive Rooms, 10 Romantic Cabins, Go Kart Track, Pool, Jacuzzi, and Mini-Zoo. Located in Rosarito on the Pacific seashore, Los Pelicanos Hotel offers a space of tranquility and comfort. a rustic style that combines Mexican elements like the cirio cactus lamps with tile and clay bricks. Los Pelicanos Hotel has its own secure parkinglot and 29 rooms, besides our well known terrace Restaurant & Bar, where you can taste our exquisite meats and seafood, with your favorite beverage, enjoying the beauty of the blue ocean. Welcome to Rosarito. * Features 39 Exclusive Rooms, with restaurant and bar in front of the Pacific Ocean. "A pioneer in Rosarito. Good service and good price." Welcome to Brisas del Mar Rosarito Beach Resort. We are pioneers in Playas de Rosarito, and we take pride and great honor in our name. 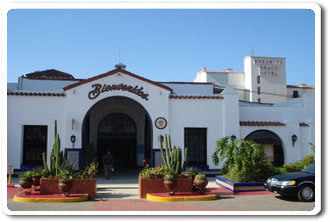 Our great location in downtown Playas de Rosarito allows easy access to the best of the city; only 2 blocks away from the gorgeous beaches colliding the Pacific Ocean and just a few steps away from diverse restaurants and their exquisite gastronomic delights, as well as numerous leisure spots, coffee houses and nightclubs. In downtown Rosarito you will find all the financial activity, since we count with many important banks minutes away from our facilities, as well as many important travel agencies and touristic information centers, spas, massage parlors, and a wide arts and crafts market. We are located just 20 minutes from south Tijuana, 25 minutes away from the International Borders in San Ysidro "the most visited in the world", and just 40 minutes from San Diego, California. * Our off the beach location makes us an affordable option. 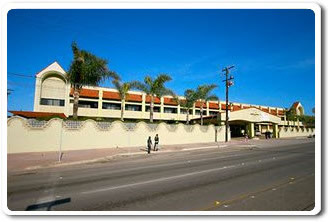 Welcome to one of Baja’s most famous landmarks, the legendary Rosarito Beach Hotel. Since it first opened its doors in 1925, millions of visitors as well as movie stars, presidents and international royalty have been attracted to it´s romantic old world charm and loving hospitality. Its popularity spawned the birth of the city of Rosarito Beach, just 30 miles south of San Diego. The Hotel has been at the heart of the popular resort destination that grew up around it. Today, as the legendary hotel becomes a 500-room full-service resort, it remains the region’s most popular hotel and a must-see destination for the city’s more than one-million visitors a year. With its grandeur, world-class restaurants, entertainment, lodging options and activities, it is easy to see why. "Your Home away from Home in Rosarito"
Pueblito Inn is the ideal place for any occasion: a romantic honeymoon, an awaited vacation with family and friends, or simply looking for a refuge against the daily life. If you are looking for a reasonable hotel to stay at that is not far from the strip and that has luxury & comfort at your service, well, this is the place to spend a weekday or weekend getaway. We have 47 rooms, queen or double beds that have the following: cable, telephones, wireless, room service, air conditioning and heaters. There is always something to do in Rosarito Beach. You can take the kids and family to the local fair, enjoy a nice day of wine tasting, go to the beach to soak up the sun or spend a day horseback riding.